On ABC’s General Hospital, teacher Willow Tait (Katelyn MacMullen) has a secret. How many Port Charles lives will be affected when it comes out? This article contains spoilers. 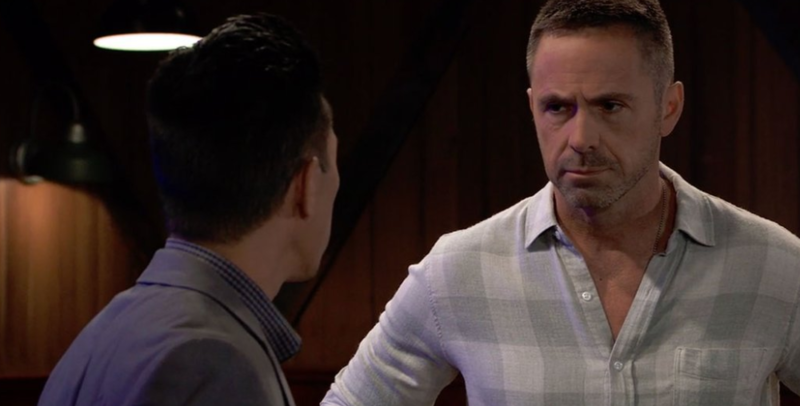 If you haven’t seen the Friday, December 21, 2018 episode of General Hospital, please do not continue reading. Introduced as Aiden (Jason David) and Charlotte’s (Scarlett Fernandez) teacher, there’s more to Willow Tait than meets the eye. Viewers have seen her attending a bereavement group at General Hospital where she made a connection with fellow griever Michael Corinthos (Chad Duell). The two have talked about their losses and how they have struggled to deal with them. On the Thursday, December 21 episode, Ms. Tait had a stranger reaction upon seeing owner Julian Jerome (William deVry) at Charlie’s Pub. And later again upon seeing a photo of Lucas and Wiley on Jerome’s phone. Immediately a conclusion was reached: Is she the birth mother or the baby Brad (Parry Shen) and Lucas planned to adopt? Brad, Julian, Nelle (Chloe Lanier) and viewers already know that the baby known as Wiley is actually Johan, Nelle and Michael’s son. The original Wiley died of unknown causes soon after his birth. And in true Nelle Benson fashion, before the scheming young woman was carted off to jail for her crimes, she convinced Brad to take her son to keep him away from the Corinthos family. Reluctantly, Brad agreed. This huge decision of lying to Lucas about the death of their son and keeping Michael’s baby weighed heavily on Brad. How could he allow Michael to believe his son was the baby that died? To make matters worse, the birth mother of the actual Wiley changed her mind about the adoption and decided she wanted her baby back. This forced Brad to turn to Julian for help. He told his father-in-law a spinned version of the truth in which Wiley’s mother had been a homeless woman he met on the road who begged him to take her child. Julian intervened. He managed to obtain information on the identity of the birth mother and in unaired scenes, convinced her to sign over all rights to her son to Brad and Lucas. But after December 20 episode scenes with Willow and Julian, it’s all but confirmed that Willow is the birth mother. The only thing needed are the actual words corroborating this theory as fact. Once the truth comes out, how will it effect Willow’s growing relationship with Michael? Better still, what will Ms. Tait do when she finds out her baby died? The revelations in the story will tear many lives apart! Update: On the Friday, December 28, 2018 episode of General Hospital, Willow admitted to being the birth mother. However like Julian and most of Port Charles, she believes Wiley, who’s really Nelle and Michael’s son Jonah, is her son. I think Willow is actually the girl who Micheal got pregnant…can’t recall her name…she had plastic surgery…watch!